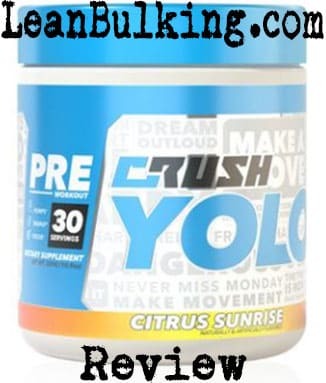 Crush YOLO Review | Pre-Workout | Ingredients | Side Effects | Worth It? YOLO is a pre-workout supplement made by Crush. It costs $39.99 for 30 serving containers and comes in 2 flavors - Citrus Sunrise and Tropical Punch. Sounds tasty, but the ingredients inside are what determine whether it'll work or not. But before that, let's take a look at the company behind YOLO pre-workout. Crush are a supplements company that market themselves as new, fresh and quirky (as you can see from the bright and colorful design of the container). Their aim is to beat the companies that market gimmicky products, and offer honest and effective supplements - we support their aim and beliefs, so let's see whether the ingredients inside YOLO pre-workout can back it up. There are 11 main ingredients inside YOLO pre-workout, which is quite a large number. But one thing we like, is that YOLO doesn't contain any proprietary blends - so you can see the exact dosage of each ingredient inside. However, from first glance, we can see that Crush has under-dosed the Citrulline Malate at 1,000mg - we'll expand more on this below, when we take you through each ingredient (so you can see how good YOLO really is). A very bad start by Crush here. Betaine is one of our least favorite pre-workout ingredients, as it's shown to be ineffective in almost every study. Not only that, Betaine causes a side effect (fishy odors in your breath and sweat). Basically, it's a useless ingredient that causes a side effect - why would you want this? Also known simply as AAKG, this is another ingredient that's shown to be ineffective. It's the salt extracted from L-Arginine, but anything taken from L-Arginine is ineffective. Simply put, L-Arginine has a poor absorption rate, so it's useless when orally supplemented. This is why Citrulline Malate is your best option when aiming to enhance your muscle pumps in the gym. (read on to find out why). This is one of our favorite pre-workout ingredients, as it's proven to improve your muscle pumps. 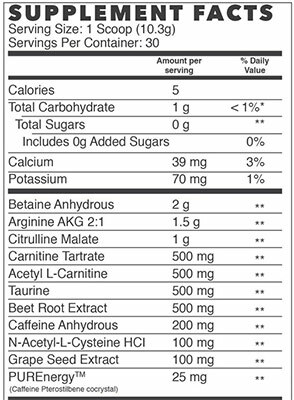 Basically, Citrulline Malate has a great absorption rate and turns into L-Arginine in your kidneys. This process raises your nitric oxide levels, which then allows more blood to rush to your muscles (resulting in better muscle pumps). 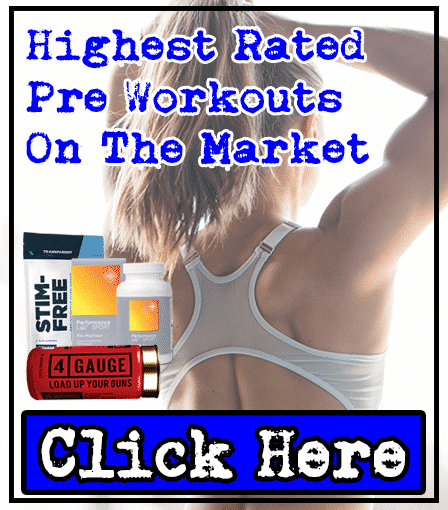 It's tried-and-tested, and if you've every taken a pre-workout with an optimal dosage of Citrulline Malate before, you'll know it works too. But there's a problem with YOLO - Citrulline Malate's been under-dosed at 1,00mg, meaning it's not likely to work. Simply put, you need a dosage of 6,000mg per serving to experience its benefit. Another great ingredient in a pre-workout. Here's why: L-Carnitine Tartarte has shown to reduce fatigue and muscle damage, while being able to improve your focus in the gym - these are all great benefits to boost your gym session and help you reach your fitness goals faster. It's dosed well, so there's no problems with this ingredient - good job by Crush. There's no need to have 2 forms of L-Carnitine; they both deliver the same main benefits, but Acetyl-L-Carnitine can slightly promote fat loss too. 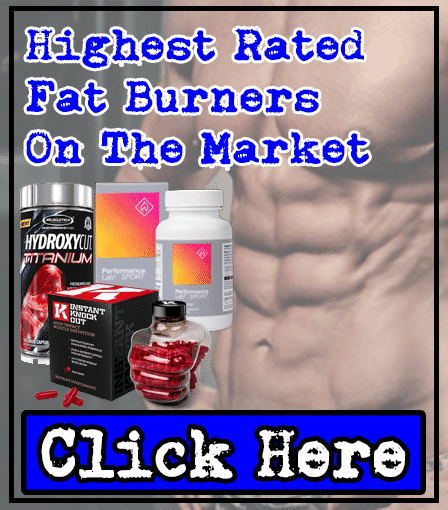 However, this isn't a benefit that's needed in a pre-workout - there are already quality fat burners on the market, so there's no need for fat burning ingredients in pre-workouts. We'd chose L-Carnitine Tartrate over ALCAR, and there's no need for both in one product. Taurine has shown to reduce cramping in the gym, but doesn't offer any other benefit. Basically, keeping yourself hydrated can deliver the same benefit, so there's not much need for Taurine in a pre-workout. The reason why companies add Taurine to pre-workouts, is because many believe it boosts energy (as it's in energy drinks such as Red Bull). However, studies have shown that Taurine has no effect on energy levels. There isn't any negatives to having Taurine in here, but it's definitely not a key pre-workout ingredient. This is extracted from the same beetroot you add to salads and other foods, but not many are aware of its benefits. Simply put, studies show that Beetroot can seriously improve your endurance in the gym - and here's why; Beetroot contains a high amount of nitrates, which boosts your nitric oxide levels (and therefore improves your muscle pumps). Ultimately, enhanced muscle pumps results in enhanced endurance too. For this reason, Beetroot Extract is one of our favorite pre-workout ingredients. Caffeine is the best stimulant you can find in any supplement; it's shown to improve your strength, endurance, energy and focus in the gym (which are all key benefits that'll enhances your gym session). The only thing you have to worry about is the dosage, but Crush has added a great dosage here (200mg). We recommend that you consume a maximum of 200mg Caffeine to begin with - to stay safe from side effects such as jitters and energy crashes. 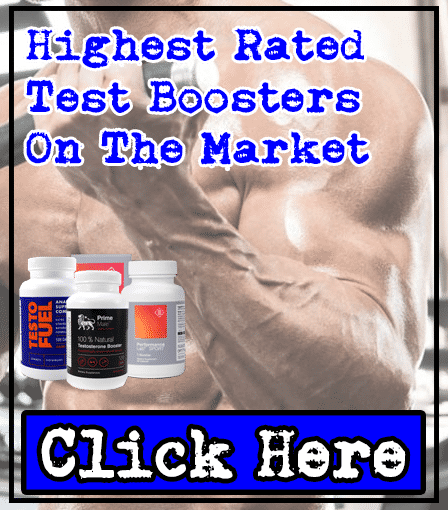 This is simply an amino acid that's believed to be a strong anti-oxidant - good for your general health, but won't do much to improve your workouts directly. For this reason, it's not a great ingredient to have in a pre-workout (we'd have preferred to see Creatine Monohydrate here instead, as that's proven to boost your strength and endurance in the gym). 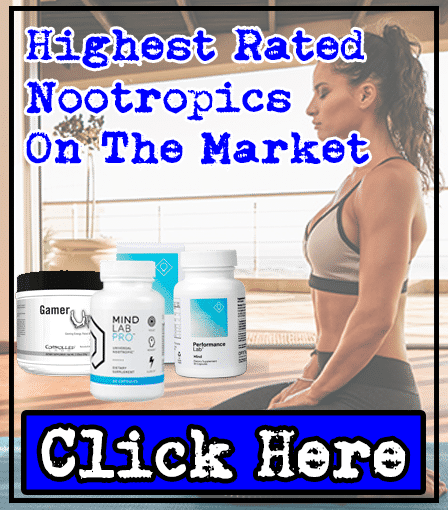 Similar to how Beetroot Extract contains high amounts of nitrates, Grape Seed Extract does too - meaning it can boost nitric oxide levels and enhance muscle pumps and endurance in the gym. However, there hasn't been as many studies proving that Grape Seed Extract works. Ultimately, you don't need both Beetroot Extract and Grape Seed Extract here - and we'd choose Beetroot Extract everytime. This is patented ingredient that contains Caffeine. Crush already had an optimal dosage of Caffeine before adding this, so we're not sure why they've added PUREnergy in YOLO pre-workout. It's believed to offer the same benefits as Caffeine, but isn't as reliable (as there hasn't been as many studies on PUREnergy). For this reason, we believe the best stimulant available is Caffeine on its own - there's no need to fix something that's not broken here. The good news is that there aren't many ingredients that can cause side effects in YOLO pre-workout. But that doesn't mean it's free from side effects - Betaine can cause your breath and sweat to smell fishy, and your risks of suffering from jitters and energy crashes are increased due to YOLO containing 2 stimulants. 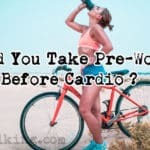 For this reason, we always recommend that you choose pre-workouts that contain Caffeine as the only stiumulant; Caffeine is tried-and-tested to be safe and reliable, so there's no need to add other stimulants. In all honesty, Crush have stayed true to their philosophy - they haven't tried to market any gimmicks with YOLO, and we respect that. However, they just haven't done enough research (as they've added some ineffective ingredients that have shown to be useless in studies). 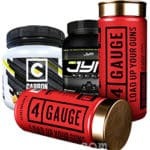 This is why the best supplements always contain the best ingredients in optimal dosages; Crush added a great ingredient (Citrulline Malate), but under-dosed it at 1,000mg - making it ineffective. We're happy that they added great dosages of L-Carnitine Tartrate, Beetroot Extract and Caffeine though. Ultimately, we believe a 3 star rating is very fair and justified, in our honest opinion. YOLO isn’t a bad pre-workout, but it can’t compete with the best on the market. Great in depth review of the product! Thank you for taking the time to write this up. The under-dosing for citrulline and carnitine is the stacking ability with the BCAA product that we offer, GO! – we kept doses lower in the pre so that it’s more beginner friendly, but with the option to add much more water and include one serving GO! and one serving YOLO, we wanted to make it much more customizable. You will see this with the new products that we put out as well. Reason for higher online price-point is retail. We will be sub $34 in stores! Thanks again for writing this up! If you raised the Citrulline Malate dosage to 6,000mg per serving, and replaced Betaine with L-Theanine – your product would be one of the best pre-workouts available 🙂 We’d be more than happy to re-review Crush Yolo if you did this! Your BCAA Go! looks like a good product too!